My friend Hema in New Jersey asked me, how can I use local grains in the United States? While there are several wonderful cookbooks featuring such American staples as buckwheat, barley, rye it is not as easy to find recipes using millet and many recipes using these traditional yet less common grains call for even more specialized ingredients. Of course it is well worth the effort, but what if you want to make something simple with millet right now? 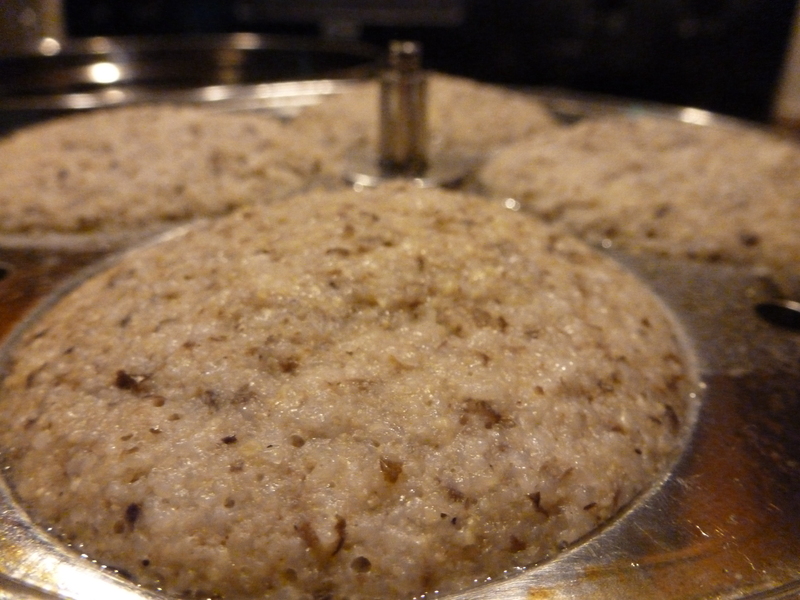 One way to jump right into using locally grown millets is to make idlis with them. Black gram, water and salt are the only other ingredients you need. Now that I have tried it, I can say, it works! Of course the millet isn’t grown in New Jersey but it is not imported from overseas either. Apart from being nutritious, proso millet enhances weed control and adapts well to many soil types and climate conditions. So says the The Agricultural Marketing Resource Center. So you can support sustainable agriculture while adding another grain to your diet. Since we are talking about millets grown and harvested in the US, I will not assume that readers are already familiar with the process of making idlis and will list the steps. Literally, just add water! The grains and beans soak by themselves. Whatever you do while they do their thing, you will be multitasking! This is a chore, but thanks to electricity and modern appliances, it involves little more than pushing buttons. Nostalgic for the fluffier texture and more nuanced flavor of the stone ground batter of yore? There’s a gadget for you too … the wet grinder! Proso millet and urad dal batter. You can do this in your sleep! Or to be precise, the batter will ferment while you sleep. Pour it in and it works! Presto – pour the batter into the plates, stack them up in the idli steamer. 1 cup black gram – called minapappu in Telugu and urad dal in Hindi. You can use whole or split black gram, but keep the peel for whole grain goodness. Wash and soak the grains for 8 hours – overnight. 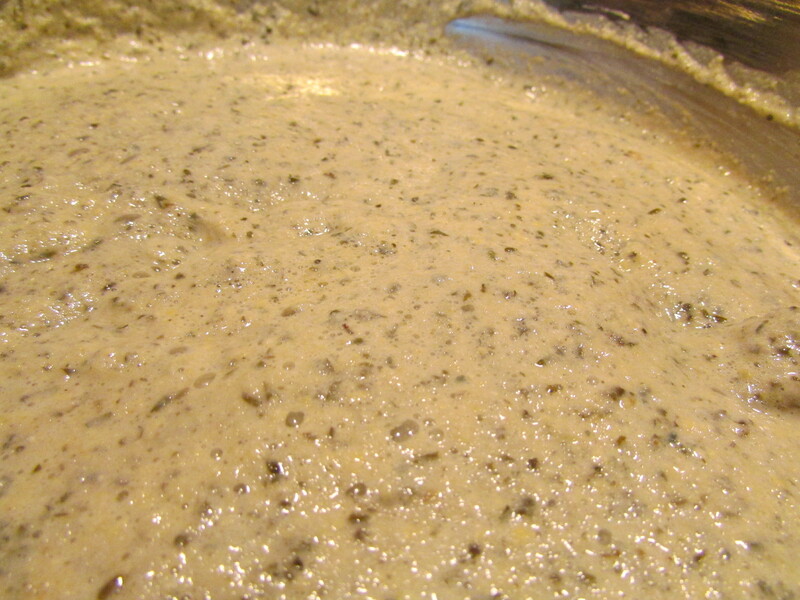 Grind to a smooth batter and allow to ferment and rise in a warm place for 8 hours – overnight. If it is not warm enough it could take longer for the batter to rise. In cold climates or climate-controlled environments, you can keep the batter in the warmest corner of the house or just turn your oven on for 1 minute and then turn it off and keep the batter there to rise. Batter should double in bulk. 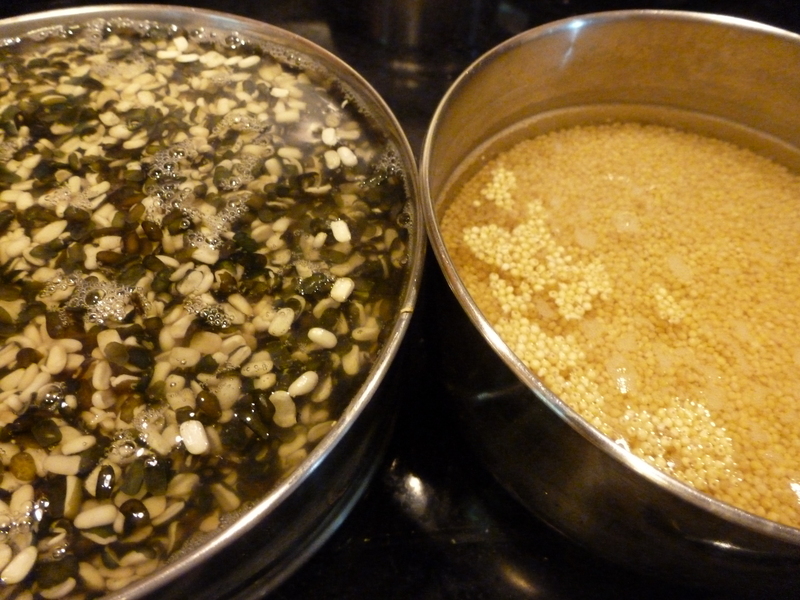 If you are feeling impatient, and it has not doubled, if it has risen to some extent and looks a little porous when you stir it, you can still use it. It might be better for dosas (see below) at this stage but you can still try it. Stack of proso millet idlis, fresh from the steamer. Oil your idli plates and pour batter into each place. Don’t pour a heaping amount because these will rise as they steam. Place the stack of idli plates into an idli steamer. If you don’t have an idli steamer you can use a pressure cooker without the pressure or a large covered pot. Don’t forget to pour water in the bottom of the steamer (or pot). Enough so that you never “run out of steam” but not enough to touch the bottom of the bottom plate – that might make the bottom plate soggy once it starts to boil. Especially if your idli plates are slotted. Let them steam for 20 minutes, then wait another 20 minutes before removing them. If your idli steamer has a whistle start the 20 minutes when the whistling begins. After 5 minutes on high heat, you can reduce the flame to medium-high but the steam should keep coming. It should keep whistling, albeit at a lower volume. p.s. The same batter makes a great dosa. Pour it on a hot pan or griddle, spread evenly and cover. Flip, let the second side cook, and voila: Proso Millet Dosa. You can make it soft and fluffy like a pancake or thin and crispy like a crepe. Depending on how thickly you have spread it, it will take 1-2 minutes to cook each side. I usually oil the pan for the first one and use no oil for the subsequent ones. Proso Millet from the Millet site. Millets: Future of Food and Farming from the Swaraj Foundation. Next Liberté, Égalité, Non à l’intouchabilité! 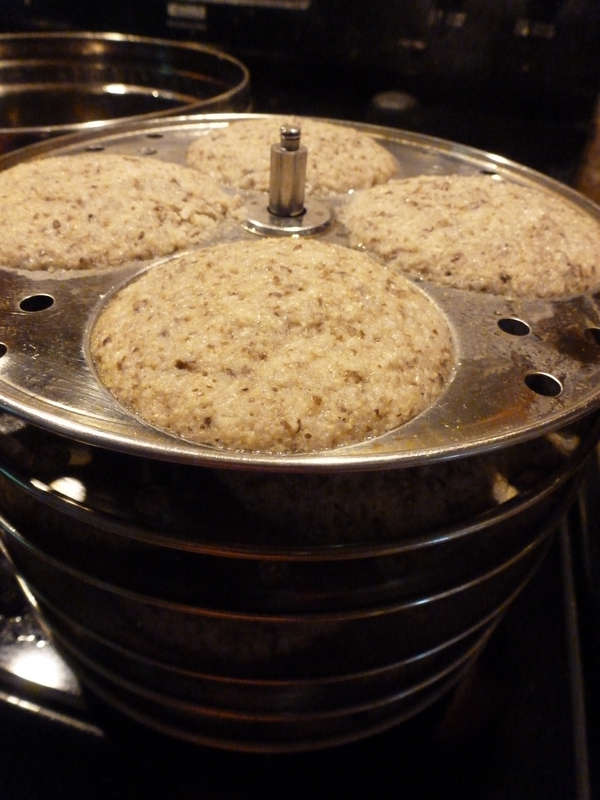 Namaste, is it possible to avoid the fermentation step in making idlis ? I dont need it to be fluffy or very soft or to rise , if thats the benefit of fermentation ? I was thinking of making idlis from whole wheat. As in just soak the whole wheat grain overnight, add the soaked urad to it and grind it. Speaking of grinding, is it possible to get some apparatus to do the grinding manually without electricity ? how long would it typically take to grind enough manually to be able to make say 8-12 idlis ? Just to add some background, I am more of a functional person, so my concern is maximum nutrition as close to the whole food source as possible, rather than anything else. To be honest I haven’t tried this. As you may know, fermentation improves the nutrient profile & absorption. You can get a stone grinder or mortar & pestle from a good kitchen supply store and you can probably grind the batter in an hour. Dosas usually work even if the batter has not fermented but for idlis, if they don’t rise they will not get cooked thoroughly.